Special Order Approximately 3-5 weeks if at stock at manufacturer's warehouse. Call store for details 618-233-0667. 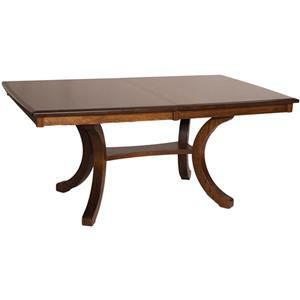 Crafted of hand-sawn solid woods and made in the USA, the Achord dining table highlights quality construction and materials. Subtly splayed legs bring transitional appeal to the piece, which is perfectly sized for your kitchen dining area or casual dining room. The table is customizable with your choice of a wide variety of finish options, and four wood options, including red oak, cherry, quartersawn white oak, two tone, and red leaf maple. Perfect for everyday dining and larger dining affairs, the table includes six leaves so that you can have all the space you need for entertaining and family gatherings. 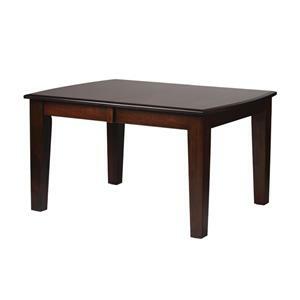 The Casual Dining Achord Rectangular Dining Table with Splayed Legs and 6 12" Table Leaves by Oakwood Industries at Mueller Furniture in the Lake St. Louis, Wentzville, O'Fallon, MO, St.Charles, St.Louis Area, MO Furniture Store and Belleville, Shiloh, O'Fallon,IL area. Product availability may vary. Contact us for the most current availability on this product. Leaves Includes Six 12" Skirted Leaves to Extend Table Length from 54" to a maximum of 126". Case Construction Oak, cherry and maple. The wood for each piece of furniture is hand-chosen for quality assurance and only excellent grade wood is used in the construction of all our furniture. Particle board is not used in any of our pieces. 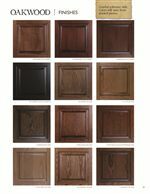 Finish & Paint Options A tough catalyzed varnish is the only finish used by Oakwood. 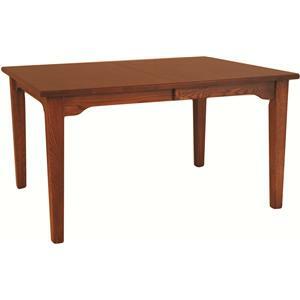 Therefore you get a durable, resistant finish on your table as well as each piece of Oakwood furniture. The finish is carefully applied and hand sanded between coats to achieve a smooth finish designed to last many years to come. 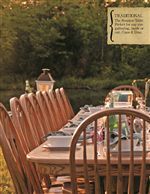 Customizable Options Many aspects of this furniture line is customizable, including chair seats, wood types, stains and hardware, which creates the perfect casual dining set to meet your needs and personal taste. 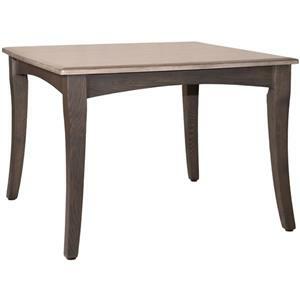 Warranty Oakwood Industries, LLC furniture (excluding fabric) is warranted for a period of ten years from the date of purchase, during active business of Oakwood Industries, LLC. We will repair or replace, without charge, any defects due to faulty materials or workmanship. Customer must return faulty product, with original invoice, to dealership where purchased. Create a lasting impression in your home with the casual dining collection. 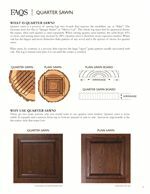 Using the finest of oaks, cherries and maples as well as durable finishes, the natural allure of the woods radiate with a handsome shine while the quarter-sewn process provides a more stable establishment. 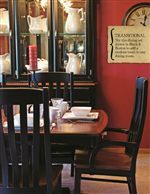 Expertly crafted in the USA using traditional techniques and close attention to detail, the tables, chairs and china hutches range from traditional, mission and transitional styles. Better still, each of those designs blend effortlessly into almost any decor. 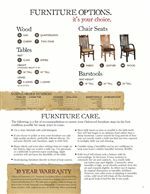 Customization is also available with fabric, leather and wood chair seat options; oak, cherry, quarter-sewn, two tone and maple wood selection and a wide variety of stain finishes and hardware choices. With beauty, quality and durability to spare, the casual dining collection is sure to enrich your home for years to come. 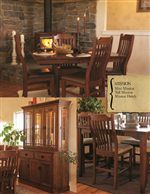 The Casual Dining collection is a great option if you are looking for Casual furniture in the Lake St. Louis, Wentzville, O'Fallon, MO, St.Charles, St.Louis Area, MO Furniture Store and Belleville, Shiloh, O'Fallon,IL area. 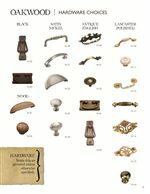 Browse other items in the Casual Dining collection from Mueller Furniture in the Lake St. Louis, Wentzville, O'Fallon, MO, St.Charles, St.Louis Area, MO Furniture Store and Belleville, Shiloh, O'Fallon,IL area.